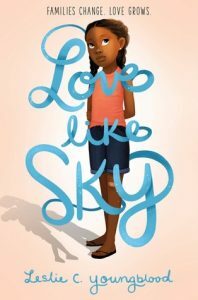 Today we welcome Leslie C. Youngblood, whose middle grade debut, LOVE LIKE SKY, was released in October of 2018. The character of G-baby (Georgie) has been with me since my first published piece, “King of Soul,” in the late 1990s. G-baby lives with her grandmother and is awaiting a visit from her father. That story was published in a now-defunct literary journal, A Place to Enter. G-baby and her sister Peaches then appeared in my MFA thesis, Selah, where the two girls witness a murder. Quite a difference from Love Like Sky (my fourth completed work, but first published novel), in which they are members of a loving, blended family and are attempting to win the affections of an older stepsister. In my thesis, the sisters are secondary characters. Even though they had a strong presence on the page, it hadn’t occurred to me to give them their own story, their own world. Then around 2010, I experienced a personal loss and writing about siblings was what I needed. I distinctly heard Georgie’s voice saying, “Put me in, coach! I can do it.” That’s how it felt. Before the publication of Love Like Sky, I’d stepped away from my tenure-track teaching position at Lincoln University in Jefferson City, MO, and moved back home with my folks. I’d reached that point where it was time to “jump.” To stay afloat financially, I worked in customer service positions and wrote every morning at 5 a.m. — a practice I still continue. I also was grieving. Writing was my way of coping, but I can’t stress the importance of grief counseling. Writing was my way, but it may not suffice for others. In April 2016, I was still working on adult fiction, but I had a draft of Love Like Sky. I’d met Laura Pegram, the founder of Kweli Journal and the Color of Children’s Literature Conference, many moons ago at the Hurston/Wright Summer Writers Workshop. I can’t mention Hurston/Wright, by the way, without noting my admiration for Marita Golden. She and Laura Pegram are among the most-genuine advocates for Black writers I know. 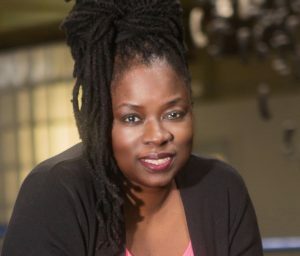 I’d reconnected with Laura on Facebook, and she remembered a short story I’d read at Hurston/Wright, “Poor Girls’ Palace.” “Poor Girls’ Palace” had been published in the Indiana Review, but she published the first novel excerpt of “PGP” in Kweli. Some time later, she told me that she was hosting a children’s literature conference. I told her that I had just finished a draft of a children’s book. I sent her a snippet, and she liked it. At this point, I’d left Jefferson City, MO, and was back home Rochester, NY, and low on funds. Laura offered me the opportunity to volunteer in lieu of the conference fee. I borrowed money, hopped on Amtrak, used a two-year old Yotel voucher, and attended the conference. I was fortunate to receive a manuscript critique with Regina Brooks. She gave me some helpful feedback. I went back home, got to work, and landed my agent in July of that year. We tweaked the manuscript and signed the deal with Disney Hyperion. That’s the short version. I fell in love with writing through the works of James Baldwin. I was a receptionist for a government entity in Atlanta, GA, trying to complete a marketing degree at night and reading Sidney Sheldon novels. Although I was struggling with the marketing degree, I’d been convinced that I needed some sort of business degree to earn a living. One day, while I was reading, an older secretary named Nettie stopped by my desk to chat. Before she left, she gave me a copy of Go Tell It On The Mountain. I read it. The next day, I changed my major to English, with a concentration in creative writing. I went on to read all of Baldwin and Morrison. In retrospect, I was reading about young protagonists, but the work didn’t fall under kid lit or middle grade. A few of my favorites are Daddy Was a Number Runner by Louise Meriwether and Leaving Atlanta by Tayari Jones, but when it comes to my first read of novels that squarely fit in the middle-grade genre, that was One Crazy Summer and the subsequent works of Rita Williams-Garcia. Those lead me to all the beauty of Virginia Hamilton, Eloise Greenfield, and Angela Johnson, to name a few. Admittedly, I’m new to middle grade, but there is nothing new about my desire to write. It is fulfilling to witness authors’ careers skyrocket. That is how it was meant to happen for that writer. All of our journeys are to be respected, not compared. I have to add that my inspiration, once my light clicked on, is a bevy of writers who treat the lives of Black people across the diaspora with the love and the wholeness we deserve. Only one part of my process is ingrained in me: I write at 5 a.m., if not earlier. I can write anytime, anyplace; I don’t care who’s around — why not finish that nod to Janet — but my preference is in the wee hours. Other parts of my process are in flux. As of now, I do not outline. And it’s not just that I don’t outline — I can’t fathom it. It makes me feel as though I’m boxed it. But I recently cut 20,000 words from a first draft, so outlining may be in my future. This most recent draft was also my first go at writing without re-reading before starting the next session. Not sure if I’m a fan of that, either. Bottom line: I’m evolving and so are specifics of my process. My goal is to have several projects on deck. If outlining can help, and my work remains authentic, I’ll go with it. If it starts to feel formulaic, I’ll abandon it. I love that we work in a field where the goal isn’t perfection but authenticity. Waiting to see Kekla Magoon’s The Season of Styx Malone on a screen, big or small. Congratulations, Leslie! Visit her online at her website or on Twitter. I LOVE books about blended families and negotiating the space of choosing to love. This one sounds like another on the (teetering) list of books to buy – and I ADORE the cover. Beautiful.